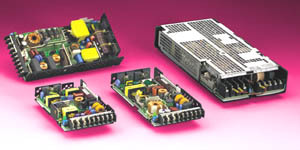 Kepco's RTW series are general-purpose, L-chassis, single output power supplies. They are available in 50, 100, 150 and 300-watt power levels. Their small size and very low profile allow the RTW to be fitted into small spaces. They feature full safety compliance to international standards and have suppressed both conducted and radiated emission to FCC class B levels. RTW are RoHS (Reduction of Hazardous Substances) compliant. A green power-on LED provides visual evidence of operation. An isolated remote ON-OFF control is built-in, as is remote error sensing. (A 4-wire Kelvin connection to the load eliminates the losses in the d-c load wires.) RTW may be operated in series for increased output voltage or in parallel for increased current. The 300W models provide for current balancing among parallel units. The output is current limited with a "square type" current limit circuit. In case of an overload, the unit goes into current limit and recovers automatically when the overload is removed; there is no shut down or current protection characteristics for these models. The output voltage setting is user-adjustable. When an overvoltage is detected, the output voltage shuts down. An interval of 30 seconds is required before resetting. The RTW Series can be mounted in a 19-inch rack using Kepco's RA 40 Rack Adapter and appropriate mounting brackets. Factory-installed covers for 50W and 100W models can be obtained by adding a C suffix to the model number, e.g., RTW 5-10KC. The 300W models include a factory-installed cover. For 300W models without covers, contact Kepco for assistance. All RTW modules are suitable as DC-DC converters, however note that Safety Agency approvals are valid only for a-c input. DC input voltage range for RTW models is 120V - 370V d-c.
RTW models can be mixed with your choice of Kepco modular power supplies (e.g., AE, AK, AEK, HWS, PAT, PRM, PTR, RKE, HSM) and packaged in one of our standard rack adapters for a custom power solution you design yourself. Or, if you chose, give us your specs and we'll design it for you. RTW are CE Marked per the LVD, EMC and RoHS 2 Directives. See applicable Declaration of Conformity.